SolidHost Review 2019: Is SolidHost a Good Hosting? SolidHost is a good option for those upgrading to a VPS for the first time. While they are a bit lacking on storage, features such as Installatron offer a nice bridge for those whose admin skills may be a bit shaky. SolidHost is a Netherlands-based company that’s been in business since 2000. During that time, they have grown to become a reliable provider of VPS and dedicated servers. While they offer a 99.99% uptime guarantee, they claim that they haven’t experienced a second of downtime in over a year. Their virtual servers offer features that make them a good entry point for those using VPS for the first time. I like the fact that you get to choose between both Windows and Linux and aren’t handcuffed to a single configuration. You also get between two and six IP addresses with your server, along with 1GB of burstable RAM in the event of traffic spikes. One thing I like about these servers is that they’ll install a cPanel and give you access to an Installatron auto-installer for a small fee. This is a good option for those that want to move up to a VPS from shared hosting but may be a little shaky on getting their base apps installed. Otherwise, you will be fully responsible for installing your own software. Ideally, you should be able to install a server from root access if you are using this product. It’s definitely not for beginners. 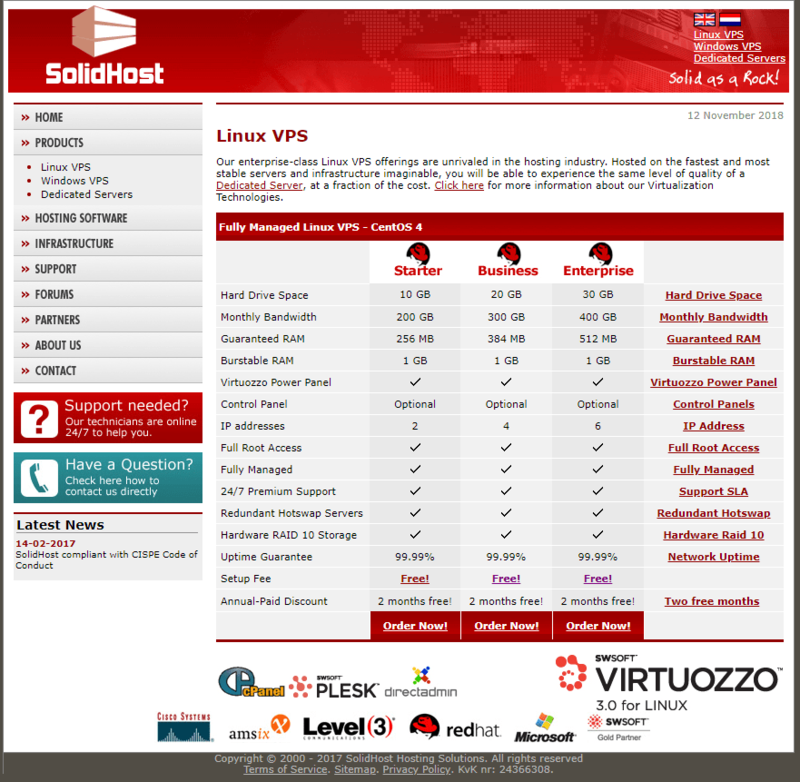 SolidHost offers both Linux and Windows VPS services with scalable plans that come with no setup fees. Plan features are the same regardless of whether you go with Linux or Windows VPS. These are good entry-level VPS systems, but I would like to see more in the way of storage. This service is better suited for those looking for Windows VPS hosting as your features are fairly solid for what you’re paying. For Linux, I only deem this as an average value because other hosts will offer more storage for the same money. SolidHost offers somewhat average support for this type of product. They provide ticket system and email support with an average 15-minute response time, but don’t offer live chat or telephone support. They also clearly state on their website that they don’t support third-party apps, so make sure their selection includes the applications and platforms you prefer before settling on SolidHost as your choice of provider. By default, SolidHost’s plans are all fully managed, and you can always open a support ticket in the event of any problems. They also have a pro-active support option available for those who’d prefer that to a reactive problem-solving approach, though this will come at an additional monthly fee. Of course, if you plan to use a VPS, you should already know how to manage a server as well as how to install and maintain your own software. If you don’t have this knowledge, go back to using shared hosting or hire someone to maintain your server for you. If you’re looking for your first VPS and need a little help getting things started, SolidHost is a great entry-level VPS. For more advanced users, you may want to look for a provider that offers better features for the same amount of money. Wondering how SolidHost stacks up against other Web Hosting companies? Enter any other Web Hosting company and we will give you a side-by-side comparison.